Last Tuesday, I stopped by the shop to mess with the clutch adjustment. I got it to where it would engage cleanly, so I took the truck out for a quick test drive. I gotta remember to leave room in the top of the radiator, as I got the gushing reminder when I slowed down and it puked all over everything, getting rusty water all over the ivory paint on the engine! Wednesday, I had Doug help me get the grill back in the front of the truck, and I drove it some more. Decided to go ahead and put the hood on it and drove it the 22 miles back to the house. I drove the truck to Branson and back on Thursday. Friday, I changed out the positive battery cable to a larger gauge, and resolved my hot starting problem, and on Sunday, I adjusted the clutch to have a lower engagement point on the pedal. It’s been driven to work Tuesday and Wednesday of this week, and so far I have about 385 miles with the 283. I have also figured out that it gets MUCH better gas mileage at 60-65 MPH than when I push it closer to 70MPH! I about choked when I calculated around 13mpg on the last tank of gas. After I hit the 500 mile mark, I’ll add a little Seafoam to the engine oil and run it for a little while to see if that helps the rings loosen up a bit more. I knew that the 283 was gonna leak oil, as I probably should have changed the rear main while I had it on the engine stand, but dang it…I was on a mission to get it in the truck, and that leaves me a project for this winter. 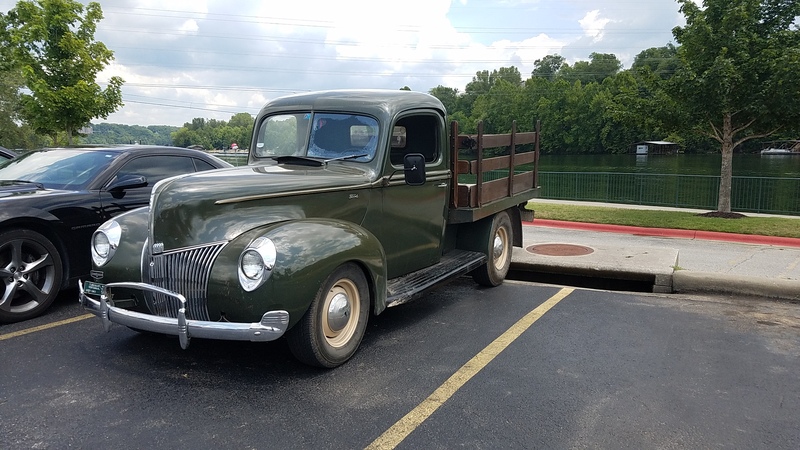 I’m planning on driving it over to the HAMB drags, later this month, and if I can’t fix the latest mystery noise in the coupe, it may make the trip over to Evansville for the Frog Follies. It’s good to have the truck back on the road, even though it’s not perfect!